Want to know a few scary truths ignored by too many content creators? Editing and proofing are not the same thing. And you can’t adequately execute the two at the same time. And if you think the same person can write, edit, and proof their own work, you should be afraid, very afraid of publishing that content. The tasks include checking written material for grammar, spelling, style and punctuation issues before it’s prepared for proofreading. A copy editor may also do a rewrite, if necessary, to fix any problems with transitions, wordiness, jargon, and to ensure the style of the piece fits with the publication. This work is known as revision. In contrast, proofreaders review the content after it has gone through the editing process. They scrutinize the content in its finished and almost-published state to catch any typographical or minor errors that weren’t fixed in the editing process or were created in the production process. For example, at CMI I edit the blog, but Lisa Higgs proofreads the posts in WordPress before they go live. With CCO magazine, I put on the proofreader’s hat, while Clare McDermott edits the articles. TIP: If you wear a proofreader hat for some projects and an editor’s hat for others, don’t attempt to do one right after the other. Take a break. Exercise your brain with a non-word activity. If you don’t take a breather, you’re likely to be wearing both your proofer and editor’s hats – and the content review will be messy and unfocused. Make sure you understand the overall purpose for the piece of content for the audience and for the brand before you read the first word. TIP: Require content creators to write one or two sentences at the top of the content to explain to the editor who the intended audience is and why the content was created. Go through the content again as an editor. Put your hands on the keyboard (or pen in hand) and note where the content doesn’t work well and why. Does the opening grab the reader’s attention? Is the content focused on a singular theme throughout the piece? Can every sentence and paragraph be understood? Does the order of the content flow logically? Does the content represent the brand’s voice and style? Pause, then edit. Depending on your process, if the needed changes are significant, return the marked-up content to the writer to revise. If the content won’t be going back to the writer, go ahead and make the changes. Read through a final time to ensure that the content reads well from the audience and brand’s perspective. TIP: If you revise the content significantly, go back to the writer, especially if the article includes a byline, to make sure you edited accurately. Ensure factual correctness and proper credit. If the content includes research, statistics, opinions, or quotes, make sure they are accurate and attributed correctly. In digital form, make sure links go to the original source of information (not to another post quoting the original content). Do the math. If the content includes numbers, make sure they add up correctly. For example, if an article about favorite ice cream flavors includes the sentence: “70% agree chocolate ice cream is better than vanilla,” the next sentence should not be “one-third prefer vanilla over chocolate.” The math doesn’t add up. Review with your style guide in view. Scrutinize the copy to make sure it follows your brand’s style guide and chosen dictionary. For example, the CMI Style Guide is the AP Style Guide with some minor customizations for the brand. TIP: Create checklists for editing and proofreading to ensure that each step is completed. When someone must physically check off an item from a list, he or she is more likely to do it. Plus, completed checklists with the editor and proofreader’s names also serve as a helpful tracker of who was responsible for each piece of content. Review for flow and understanding. Though the editing process should have taken care of any problems in this area, proofreaders must read through the content for their own understanding so they can properly review the content. And if flaws are found at this point, make sure to address and fix them, preferably with input from the editor. Read each sentence for proper grammar. This is what most people consider proofreading – the subject-match-the-verb stuff. Check spelling of each word. This sounds easier than it is. If you spell-check the same way you read (top to bottom, left to right), you’re less likely to catch errors because your brain is still reading for comprehension. Start with the last word in the content and work your way up to the top, checking each word’s spelling as you do. Evaluate the content in published form. Review the content to make sure it appears the way it was intended. Do all the subheads follow the same typography? Are there any awkward line breaks? Does the content match the table of contents? Do all the links work? TIP: Proofreaders should document the mistakes they find more than once. Share that information with the writer and editor to prevent (or at least minimize) future occurrences. NOTE: If your team only has the resources for a single person to handle editing and proofreading duties, that’s OK. Just make sure to create a production schedule that at least allows for editing and proofreading to happen on separate days. You also can use tools like Hemingway App and Grammarly to help in the editing and proofreading process. 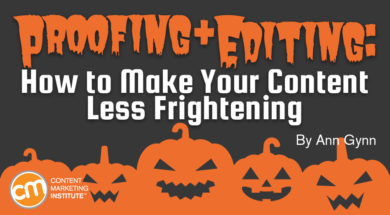 By recognizing the truth that editing and proofreading are two distinct responsibilities, you’ll improve your content results so they won’t be as scary for your readers or your brand. You’ll also avoid spending time on big problems that arise from poor editing and poor proofreading (lack of interest and trust in your brand’s content, for example, which ultimately lead to fewer readers). Improving your content creation is a hot topic in the CMI newsletter. Subscribe today.